VECCA sponsors various exhibitions and workshops throughout the year. Members receive discounts, as noted below. SHENANDOAH COUNTY GOVERNMENT BUILDING - Along the walls of the main corridor near the Treasurer's Office at 600 N. Main Street, Woodstock, VA, you can see an array of artwork from local artists. The building is generally open to the public, Monday through Friday, 8 a.m. to 5 p.m. Call Barbara Randel (540-984-9299) for sales or visit 7 East Gallery. - APRIL - "Art From the Homestead" by Carolyn Findler with a reception on Sun, Apr 7, 3-5 p.m.
- MAY - "Thoughts on Canvas" by Pat Ward with a reception on Sun, May 26, 2-4 p.m.
- JUNE - Debra Cornell with a reception on Thu, Jun 6, 5-7 p.m.
ART IN THE HALLS - Ongoing - Located in the Shenandoah Memorial Hospital Surgery Center. 2019 VECCA VISUAL ART & MUSIC SCHOLARSHIPS are offered to graduating Public and Homeschooled High School students who reside in Shenandoah County. Applications are at each High School Guidance Office, at 7 East Gallery (123 S. Main Street), or downloadable here. The deadline for submitting these applications is April 8. 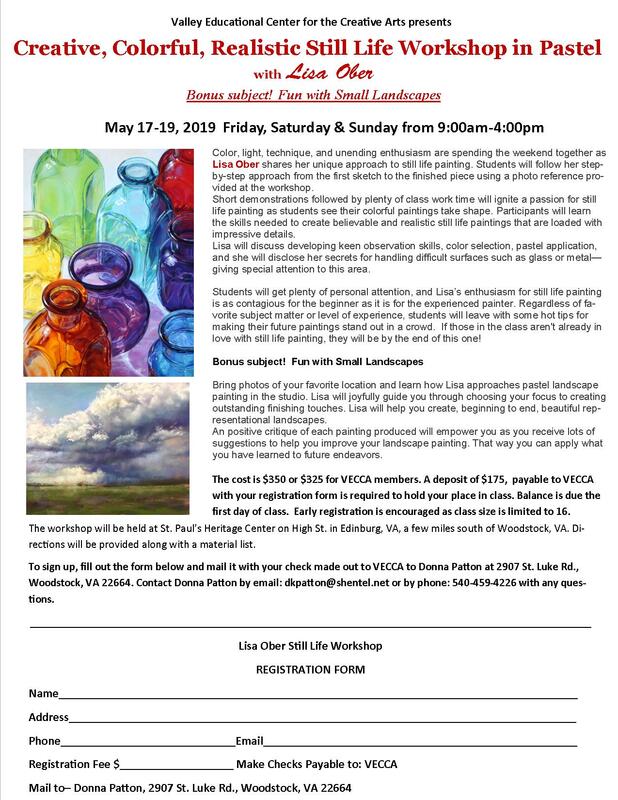 CREATIVE, COLORFUL, REALISTIC STILL LIFE WORKSHOP IN PASTELS with Lisa Ober - Friday, May 17 through Sunday, May 19, 9 a.m. to 4 p.m. at St. Paul's Heritage Center in Edinburg, VA. Cost is $350 (or $325 for members). Early registration is encouraged, since space is limited to 16 participants. Contact Donna Patton at (540) 459-4226. GUITAR LESSONS with Larry Sasser - Wednesday & Thursday evenings from 6 to 9 p.m. at 7 East Gallery. All levels welcome. Cost is $15 for half-hour private lesson. Call Larry at (540) 933-6496 to schedule. OPEN PAINTING STUDIO - Wednesdays, 9 a.m. to 12 noon at 7 East Gallery. Free. Contact Dan Voss at (540) 481-0455. - MAY 25: Art-inspired writing at 7 East Gallery; stop by any time between 1 and 4 p.m.
- MAY 26: VECCA Writers' meeting, 2 p.m. in 7 East Gallery studio space. - JUN 1: Art-inspired writing at 7 East Gallery; stop by any time between 1 and 4 p.m.
- JUN 14: Art-inspired writing at 7 East Gallery; stop by any time between 1 and 4 p.m.
- JUN 30: VECCA Writers' meeting, 2 p.m. in 7 East Gallery studio space.